The decision to provide in-home care in Oshkosh for your senior loved one can be one of the most beneficial decisions you and your loved one make. However, it can also be a difficult decision for your loved one to accept and adjust to. Here are some tips to help your loved one adapt to at-home care. Let your loved one know what will change with the new care plan. As difficult as it was for you to make this decision, your senior loved one is probably hesitant to accept it because this decision could impact his or her life significantly. Preparing your loved one can make the transition easier, and knowing what to expect will significantly boost your loved one’s reception of home care. Talk with your loved one about what in-home care entails, whether your loved one’s Oshkosh caregiver will be there on an hourly or live-in basis, and any other pertinent information that may make your loved one comfortable. Another good thing to discuss are boundaries your loved one would like to have respected and how to make that happen. It’s important to review your loved one’s boundaries so he or she can maintain independence while receiving home care. It may be intimidating for your loved one to have in-home care provided by a complete stranger, but if you ask the assigned caregiver to meet your loved one beforehand, it may make the transition easier. Make sure someone your loved one knows and is comfortable with is there to introduce the caregiver while the two of them get to know one another. A meeting beforehand can make the initial days of in-home care much easier for both parties. As your loved one adapts to an in-home assistance with tasks he or she was once able to do alone, it is normal for your loved one to feel a sense of low self-esteem. Reassure your loved one about all the positive things he or she will gain from in-home care, talk about all of the tasks your loved one is still able to do effectively, and discuss how your loved one can still be independent even while receiving in-home care. Boosting your loved one’s self-esteem is key in terms of adapting to home care. Sometimes accepting help with daily activities, such as bathing, dressing, and eating, can be easier if you include your loved one in the planning process. Encourage your loved one and his or her caregiver to make a plan together about how to tackle each activity your loved one needs assistance with. Putting together a plan that your loved one is comfortable with and meets your loved one’s needs can make is easier for your loved one to adjust to home care. If you’re currently looking for home care for your senior loved one, reach out to Oshkosh Home Care Assistance. We are a trusted provider of Alzheimer’s, Parkinson’s, dementia, and stroke home care Oshkosh seniors deserve. Our expertly trained caregivers work around the clock to ensure your loved one’s needs are met, whether he or she needs help with mobility assistance, personal care, or even housework. 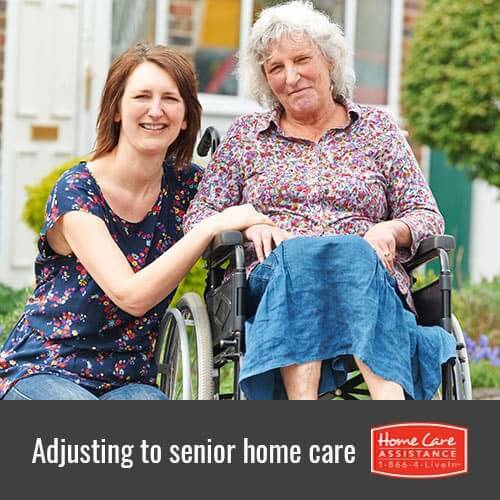 To learn more about Home Care Assistance, call us today at (920) 710-2273 and schedule a free in-home consultation.